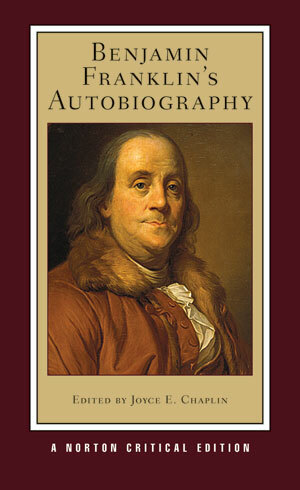 Written during the most eventful years of Benjamin Franklin's life (1771–90), the Autobiography is one of the most influential memoirs in history. This newly edited Norton Critical Edition includes an introduction that explains the history of the Autobiography within the larger history of the life-writing genre as well as within the history of celebrity. The text is accompanied by new and expanded explanatory annotations and by a map, an illustration, and six facsimiles. “Contexts” presents a broader view of Franklin’s life with a journal entry from a 1726 voyage, correspondence, a Poor Richard piece on ambition and fame, Franklin’s views on self-improvement, and his last will (and codicil). “Criticism” draws on a wealth of material that reflects both the wide range of Franklin’s achievements and the global impact of his life and memoirs. New international voices in “Contemporary Opinions” include Immanuel Kant, Honoré Gabriel Riqueti, Comte de Mirabeau, José Antonio de Alzate y Ramírez, and José Francisco Correia da Serra. “Nineteenth-Century Opinions” includes Humphry Davy on Franklin’s discovery of electricity as well as Empress Shoken of Japan’s Franklin-inspired poem. Finally, “Modern Opinions” reprints important pieces: I. B. Cohen on Franklin and the Autobiography's importance to science; Michael Warner’s theoretical interpretation of the practices of writing and printing and what they tell us about Franklin; and Peter Stallybrass’s insightful and engaging history-of-the-book perspective on Franklin’s writing generally and the Autobiography specifically. A Chronology of Franklin’s life, a Selected Bibliography, and an Index are also included.